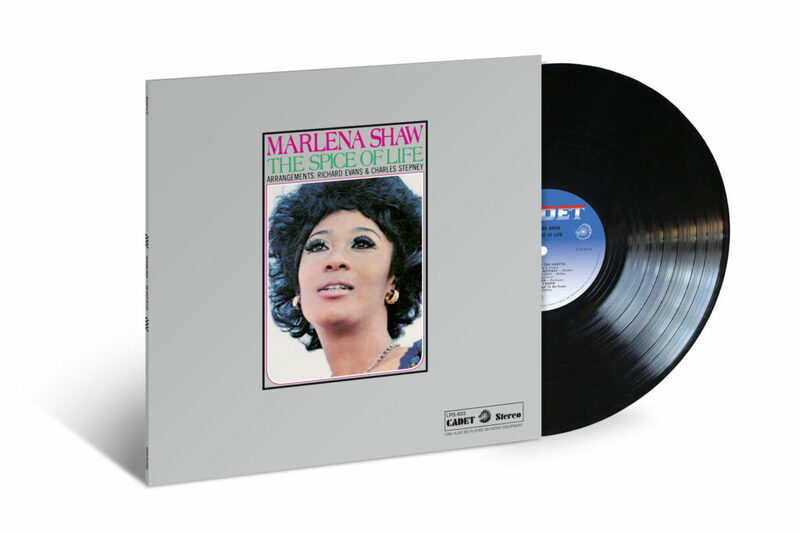 LOS ANGELES, Nov. 14, 2018 /PRNewswire/ — Marlena Shaw‘s long-lost soul-jazz album The Spice of Life, widely out of print since 1977, is available on vinyl once again via Verve/UMe ahead of the album’s 50th anniversary in 2019. The Richard Evans and Charles Stepney-produced LP, featuring her enduring hit of the Ashford & Simpson classic “California Soul,” is pressed on 150-gram black vinyl with a tip-on jacket with a faithful reproduction of the original artwork. The innovative, heartfelt The Spice of Life, originally issued on the Chess subsidiary Cadet Records in 1969, established Shaw as a fully-fledged artist; drop the needle on any track, and you’re liable to hear psych-blues guitar runs (“I Wish I Knew (How It Would Feel To Be Free)”), firebrand sloganeering (“Liberation Conversation”) and even traditional blues (her takes on “Stormy Monday” and Carole King and Gerry Goffin’s “Go Away Little Boy”). With a supple alto register and a command of the American songbook, Shaw worked these various styles into an lively patchwork of messages and moods. The Spice of Life is packed with memorable moments; the fuzz solos rattling around “Stormy Monday,” the Northern Soul horns on “Looking Through The Eyes of Love,” the kalimbas and windchimes sparkling through “Woman of the Ghetto.” For all its innovations and explorations, however, The Spice of Life unfairly fell into obscurity for four decades. But it was only the beginning of an unlikely second life. Her version of the Ashford & Simpson staple, “California Soul,” was quickly seized upon by the rare-groove scene. It was prodigiously sampled in electronic music and hip-hop: DJ Shadow and Cut Chemist’s “Brainfreeze (Side 2),” Gang Starr’s “Check The Technique” and a remix from Diplo all used “California Soul” as a jumping-off point. It even made its way into the commercial sector; “Soul” has been used in commercials for Dockers, KFC and Dodge Ram Trucks, even finding a home on the soundtrack for Grand Theft Auto V.
Shaw’s time on Chess Records would be short-lived. After she struggled to fit her eclectic approach into Chess’ roster, she recorded for a myriad of labels, including Verve and Blue Note. She still performs in 2018, but her wildly eclectic second album still stands tall. Whether you’re a lover of crate-digging classics or plain-and-simple soul power, The Spice of Life has something for everyone.